It is the toughest, outermost layer of the brain and is closely attached to the inside of the skull. It is the important layer because this layer has involvement of the normal flow of cerebrospinal fluid (CSF) which is the lubricating and nutritive fluid that bathes both brain and spinal cord. 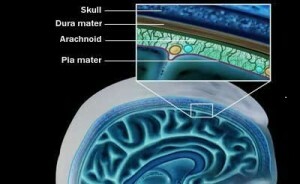 It is the inner most layer the pia, helps the direct blood vessels into the brain. The space between the arachnoid and pia contains CSF, which protects the brain from trauma. Therefore meningitis is the inflammation (protective attempt by organism to remove injurious stimuli and initiate healing) of the membrane covering the brain and spinal cord collectively called as Meninges. Because of the infection of the brain and spinal cord this condition is classified as Medical Emergency. This type of bacteria causes bacterial meningitis in various age groups. In pre-mature babies/newborns upto 3 months. In old cases group B streptococci causes meningitis. Listeria Monocytogenes may affect newborn and occur in epidemics. Older children are more commonly affected by Neisseria Meningitidis. Streptococcal pneumoniae also causes meningitis. Recent trauma to the skull lead to bacteria in the nasal cavity and enter the brain causes infection. Meningitis also occur in individuals whose immune system is impaired i.e. fight against infection get reduced or entirely absent. People having infection in head, neck and ear can lead to meningitis. Tuberculous meningitis, meningitis due to infection with mycobacterium tuberculosis, where tuberculosis is common and common in AIDS patients. This is usually due to virus but it may be due to bacterial meningitis. Fungal meningitis for example due to Cryptococcus neoformans, typically seen inpeople with immune deficiency . amoebic meningitis, due to infection with amoeba such as naeglesia fowleri common in fresh water sources. This cause is assumed when there is increased level of eosinophills (a type of blood cells) in CSF . common parasites are– Angiostrongylus cantonesis, gnathostoma spinigerum. It occur as a result of non-infectious causes like spread of cancer to meninges(malignant meningitis) and certain drugs (antibiotics ) rarely migraine causes meningitis. When bacteria reaches the meningis by one of two main routes i.e. through blood stream or through direct contact between meningis and nasal cavity. Once bacteria enter the blood stream, they entered the subarachnoid space. As a result there is large scale inflammation occur in the space, because of the response of immune system to the entry of bacteria into the CNS large amount of cytokines released and lead to cerebral edema(swelling of brain due to fluid leakage from blood vessels. When large number of white blood cells enters CSF, causing inflammation of meninges, leading to edema (interstitial edema)i.e. swelling due to fluid between cells. In addition to this blood vessels become inflamed leads to decreased blood flow causing cytotoxic edema.. these form of edema lead to increased intracranial pressure causes infection. Photophobia(intolerant to bright light), phonophobia(intolerant to loud noise), vomiting dizziness, seizures,. Joint pains. Small children may become irritable and look unwell. In infant upto 6 months of age bulging(soft spot on top of baby’s head)may present. High pitch moaning cry, dislike of being handled, blank expression, refuse to feed. a) Brudzinski’s sign is present in which when we flex(bend the neck forward)it causes involuntary flexion of knee and hip. c) jolt accentuation manoeuvre which helps to determine meningitis reporting fever and headache.The patient is told to rapidly rotate his or her head horizontally if it does not makes the headache worse, meningitis is unlikely. In menengiococcal meningitis(meningitis caused by neisseria meningitdis) rashes are common(small, numerous, irregular, purple/red spots mainly on trunk, lower extremities, palm of hands, sole of foot, mucus membrane and conjuctiva. The most important test in identifying or ruling out meningitis is analysis of CSF through lumbar puncture. It is contraindicated(not done) if there is mass in the brain or intracranial pressure is elevated. Lumbar puncture is done by positioning the patient, usually lying on the side, applying local anaesthetic and inserting a needle into the dural sac(sac around spinal cord)to collect CSF. When this has been achieved the “opening pressure “of the CSF is measured by using a manometer. The pressure is normally between 6 and 18 cm water. In bacterial meningitis pressure is elevated. If fluid is cloudy, high level of protein, white and RBC’s or bacteria suggest bacterial meningitis.